A century after its creation, Lorado Taft's "Black Hawk" statue still looks out proudly over the Rock River Valley and nearby Oregon, Ill. It was a cold December day in 1910 when Lorado Taft, John Prasuhn and their crew finished pouring the concrete giant. Twenty-eight men had spent 10 days working 12-hour shifts around the clock, mixing and pouring tons of concrete into a form that was protected from the cold by a sheath of muslin, burlap and steam-pipe insulators. When finished, they packed up their tools and returned to their winter homes. As he left Oregon, Ill., Taft hoped this statue would last longer than his prior attempt; a winter storm the year before had blown down that cast. The following summer, Taft’s crew members had dug down through soil and bedrock, using shovels and pick axes, to install a massive foundation. Taft had exhausted money and materials in his efforts to craft one of the world’s largest concrete statues. It was now or never. The monolith survived the frigid winter, and when Taft returned in springtime to peel back the mold, he and Prasuhn discovered their plan had worked. As Taft cut back the plaster and chicken mesh cast, he discovered that the intricate details in the face – the kind of details that would be his signature in other masterpieces – had set almost flawlessly in the concrete. 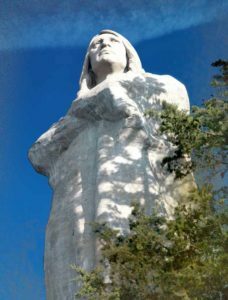 The statue stood solidly implanted on a bluff 125 feet above the eastern bank of the Rock River, overlooking Route 2 and nearby Oregon. As the sun set, it was illuminated by a blazing orange glow, just as it is today on any sunny evening. Work crews stripped away the form and touched up the details in time for its formal dedication in July 1911. A century later, Taft’s somber American Indian, commonly known as Black Hawk, still keeps watch over Oregon. Today he protects the site where an ancient tree and its eagles’ nests once marked a collaboration of unique turn-of-the-century artists. Their legacy is still felt here. Like any great masterpiece, this concrete giant was a true challenge for Taft. Locals know this famous statue by many names – “The Eternal Indian” and “Black Hawk” are the most popular. The statue itself is nearly 50 feet high, one of the tallest concrete sculptures in the world. Poured with 412 barrels of Portland cement, it hardened into 238 cubic yards of concrete with over two tons of steel reinforcement. The steam engines that helped to cure the statue pumped some 65,000 gallons of river water. This was neither Taft’s first foray into concrete sculpture nor his only lasting work. He was nearly named the sculptor to build Mount Rushmore, and his 1903 book, The History of American Sculpture, became the foremost text on the art for some 65 years. His public and private works span the country, from Washington, D.C., to San Francisco, but his most significant art is visible right here in the Old Northwest Territory. Taft was born in 1860 in Elmwood, Ill., a small town about 20 miles west of Peoria. His father joined the faculty at the University of Illinois, Urbana-Champaign, when Taft was a boy. After finishing his bachelor’s and master’s degrees in Champaign, young Taft studied at the École des Beaux Arts in Paris, a premier art and architecture academy that emphasized classical forms and intricate details. When he returned to Chicago, Taft established his own studio there and began teaching at the Art Institute of Chicago. He was known as a dynamic and energetic teacher, passionate about classical sculpture. He began receiving commissions and designed, with his students, public fountains, war memorials and cemetery monuments. His work on the Horticultural Building at Chicago’s 1893 Columbian Exposition earned him a national audience. The connections he built as an instructor at the Art Institute, and later at the University of Chicago, led him to Oregon, then a favorite summer retreat for Windy City elites. Gov. Frank Lowden, married to the heiress of the Pullman railcar fortune, summered there, as did Wallace Heckman, a Chicago lawyer whose famous clients included the Art Institute of Chicago and oil baron John D. Rockefeller. During the summer of 1898, Heckman opened his Oregon estate to a group of artists, poets and architects who were searching for a summer retreat of their own. He agreed to lease 15 acres to them for a new art colony. The original 11 artists and their guests could stay on the land as they pleased, so long as they paid him $1 a year and offered two art lectures per year to the nearby city. The group called its colony the Eagle’s Nest, named for a gnarled old tree along the bluff that was filled with nests. Some artists, like Taft, constructed studios and cottages right away. Others lived in little more than shanties or tepees while they spent their summers searching for inspiration in the wilderness, where Lowden State Park and Northern Illinois University’s Lorado Taft Campus now exist. From time to time, the artists hosted plays and entertained celebrated artists and other visitors, such as E. Thomas Seton, founder of the Boy Scouts of America. It was in this unique environment that Taft began dreaming of a grand statue. Taft had worked in concrete before, but never on this scale. For help, he turned to Prasuhn, a former student, for engineering knowledge. The two men devised several working models before constructing the massive plaster shell. The statue is built like a concrete smokestack, hollow on the inside. The head, nearly five feet tall, was poured in place above the body. Preparing for the pour was a major challenge. After the first cast was destroyed, crews spent the summer of 1910 hollowing out six feet of soil and another three feet of bedrock to anchor the statue foundation. They built a complex wooden form to hold the plaster and chicken mesh cast, and they raised a giant clay-and-plaster bust. As the work progressed, Taft ran into supply problems and money shortages, forcing delays. When the work was completed, Taft and Prasuhn packed up and headed to Chicago for the winter, returning to Oregon in springtime to discover the nearly-flawless casting. Did the sculpture really depict Black Hawk, the famous Sauk warrior? The face of the statue bears little resemblance to other depictions of him, and legend suggests that the statue combines Fox, Sioux and Mohawk traits. Taft himself was no help in answering the matter. Taft’s and Prasuhn’s work of art was heralded as a revolution in concrete technology. This feat was part of the justification for transforming Heckman’s estate into Lowden State Park in 1945. The statue received a cover story in Scientific American magazine in 1912 – not too bad for “an experiment,” as Prasuhn described it in that article. The backyard monolith was Taft’s most enduring and beloved contribution to our area, but it’s not the only mark he left behind. Taft was an educator who enthusiastically shared his passion for art with local residents, through art associations and lectures to various groups. And, as part of the Eagle’s Nest lease, the artists invited the public in to view their artwork and performances. Taft knew that the common farmer or laborer rarely shared his passion for art, but his “Clay Talks,” as he called them, gave audiences something to watch while listening. He gave an estimated 1,500 Clay Talks around the country during his lifetime, and he also lectured and socialized with the Rockford Art Association, a forerunner to present-day Rockford Art Museum (RAM). RAM still recognizes Taft’s local impact, with two plaster castings on permanent display. The statues were meant to be cast in bronze but never were, according to museum documents. Titled “Knowledge” and “Despair,” they were donated by Taft’s wife after his death, and remained in storage until they were restored in the late 1990s. In Oregon, a 1916 war memorial called “The Soldier’s Monument,” designed by Taft and two Eagle’s Nest architects, graces the Ogle County Courthouse lawn, honoring some 3,500 Ogle County veterans of the Civil War, Spanish-American War, War of 1812 and Mexican War. Visitors to Oregon’s Mix Park can still find a 1913 fountain named “The Fish Boys,” in which two boys kneel at the side of a shallow pool, each smiling and holding a large fish with water flowing from its mouth. The legacy of Taft and the Eagle’s Nest Colony finds a home at the Oregon Public Library. The 1908 Carnegie-funded library was designed by brothers I.K. and Allen Pond, Chicago architects who were members of the original art colony. A specially-designed gallery on the upper level was built to display the summertime works of the colony. Today, it’s a shrine to the city’s artistic experience, filled with paintings and sculptures, including a four-foot tall working model of the Black Hawk statue. “This is something of a hidden gem, because not a lot of people know it’s here,” says Marsha Zaccone, library director. 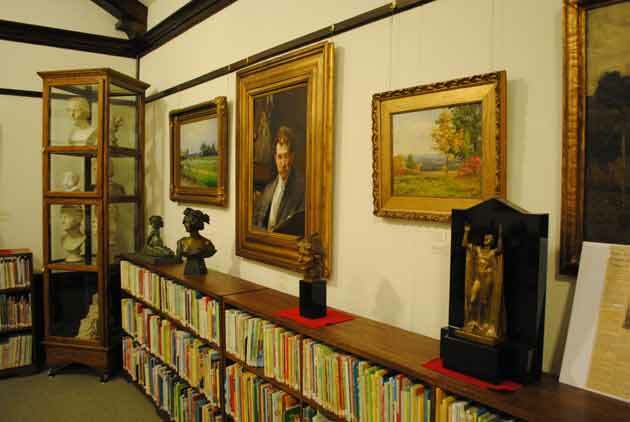 Many of the library’s pieces depict scenes from the bluffs at Eagle’s Nest, while others depict portraits and European landscapes. It’s an impressive collection for a library, says Zaccone. Some of the library’s pieces have been displayed at the Art Institute of Chicago. The library’s most recent acquisition is thought to be one of Taft’s last pieces. Betty Croft, a member of the library board, recently helped a friend to acquire a bronze model of “Aspiration,” intended to be a grave marker for a wealthy Chicagoan’s son. Shortly after Croft donated the casting, Zaccone got a call from a Chicago man who wanted to donate a small plaster model of “Aspiration.” Parts of its arms are missing and reveal the wire supports inside. Visitors to this unique gallery also find a working model of “The Blind,” a statue originally inspired by a play performed one summer at the Eagle’s Nest. Based on Maurice Maeterlinck’s “Les Aveugles,” the statue depicts a dozen blind people, some with eyes closed and others with no eyes at all. One woman holds a baby, whose eyes are open. A later bronze casting is on display at the University of Illinois. Taft died in 1936, just a few weeks after dedicating his final statue, a Lincoln commemorative in Quincy, Ill. With his death, the Eagle’s Nest colony faded away; the last member died six years later. By the 1950s, Harry Nurmet, a spirited Estonian immigrant, had formed a new group of Oregon-area artists. He called it the Eagle’s Nest Art Group, in honor of the original colony. That group continued for several decades. By 1998, the second iteration had formed. For the past decade or so, the modern-day Eagle’s Nest has included 40 to 60 area artists who gather for weekly painting sessions and occasional group workshops. Elsewhere in town, artists are halfway finished with their 10-year goal of installing a new sculpture around Oregon each year. Every summer, artists converge on nearby farms for the week-long Fields Project, during which they create art in the pastoral scenery, and some mow field designs onto 5-acre palettes of grassland. As Taft’s works approach their 100th birthdays, there’s growing awareness about their value to the community and the need to preserve them. Oregon’s war memorial is stained and cracked. Black Hawk is showing cracks and his elbows are crumbling. The statue has undergone several repairs over the years. Prasuhn repaired the elbow after it was struck by lighting in the 1940s. In the 1990s, workers repaired hairline cracks that ran up and down its length. According to a 2008 study funded by the Illinois Department of Natural Resources, the statue is structurally sound but requires nearly $400,000 worth of surface repairs. Frank and Charron Rausa want to make sure the statue receives those repairs and stands for another 100 years. Since the Sterling, Ill., couple read about the study in a newspaper article, they’ve been drumming up interest about the statue and its preservation. As a former history professor, Frank appreciates the statue for many reasons. The couple helped to get the statue listed on the National Register of Historic Places in 2009. There’s no government funding available for repairs, so they’re turning to private donors. So far, their efforts have netted about $37,000, all of which is set aside in a special Black Hawk fund through the Illinois Conservation Foundation. The fund also receives help from the new Oregon Trail Days festival, which donates a portion of event proceeds to the cause. It’s still one of Oregon’s big tourist draws, and this summer promises even more attention, as the city prepares for the statue’s 100th birthday. A special commemoration is set to coincide with the Oregon Trail Days festival, July 15-17. As a member of the library board, Croft, now 84, has spent 10 years sharing historical details and sites with tourists. She’s spent summers sitting in an information booth on the courthouse lawn, chatting with tourists. Croft also visits the statue, sharing stories and historical information about Taft, the art colony and Oregon. She still is amazed to see how the concrete giant draws visitors from around the nation and beyond. This entry was posted on Thursday, April 7th, 2011 at 11:57 am	and is filed under Features, Top Posts. You can follow any responses to this entry through the RSS 2.0 feed. Both comments and pings are currently closed. I remember many picnics our family would spend at this park, and I always enjoyed walking up to the Black Hawk statue. Thanks for the terrific history of this wonderful sculpture and of Lorado Taft, an incredible artist whose this and other work I well remember from my days of living in or near the great city of Chicago.